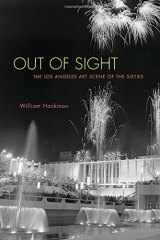 Los Angeles typically doesn't get any respect, and the situation was even worse in the 1950s and 1960s when it came to the fine arts, writes William Hackman in "Out of Sight: The Los Angeles Art Scene in the Sixties' (Other Press, 256 pages, in-text photos, color insert, $27.95). Histories of modern are typically -- and rightly -- centered in Paris and New York, where museums, collectors and dealers were well established to serve artists. Until 1965, there was no art museum, few collectors of note and even fewer galleries in Los Angeles, Hackman writes. "Out of Sight" tells of the quick rise, fall, and rebirth of the L.A. art scene—from the emergence of a small bohemian community in the 1950s to the founding of the Museum of Contemporary Art in 1980— and explains how artists such as Ed Ruscha, Robert Irwin, and Ken Price reshaped contemporary art. Hackman also explores the ways in which the L.A. art scene reflected the hopes and fears of postwar America—both the self-confidence of an increasingly affluent middle class, and the anxiety produced by violent upheavals at home and abroad. Perhaps most of all, he pays tribute to the city that gave birth to a fascinating and until now overlooked moment in modern art. Having lived in Los Angeles in the 1970s through 1992, I saw much of this expansion of the Big Orange into a major art center. Hackman quickly filled in the gaps in my knowledge of the art scene. It's a wonderfully readable account, accessible to the general reader as well as the art specialist. William Hackman, longtime arts journalist and former managing editor for public affairs at the J. Paul Getty Trust, has written extensively about the visual and performing arts. His essays, articles, and reviews have appeared in major American newspapers and magazines, including the Chicago Tribune, the Philadelphia Inquirer, and the Los Angeles Times. His books include Los Angeles County Museum of Art, for the Art Spaces series (Scala, 2008), and Inside the Getty (J. Paul Getty Trust, 2008). He lives in Los Angeles.